Interview mit Roo Panes - minutenmusik. Wir haben Roo Panes vor seinem Konzert im Blue Shell in Köln getroffen und durften ihm ein paar Fragen stellen. minutenmusik: Hi Roo. Welcome to Cologne. Have you played in Germany before? 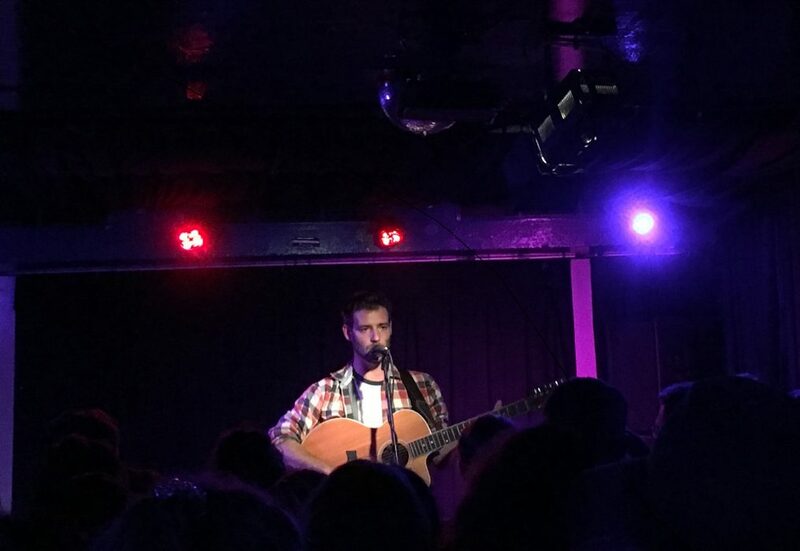 Roo Panes: Yes, actually I have just played a few gigs, for example at Haldern Pop and Das Fest. I like the German audience. They are always very attentive. minutenmusik: What do you like more? Playing live gigs or working in the studio? Roo Panes: The truth is probably working in the studio. I´m on a journey towards loving playing live, but my character has always been more of a writer. When I started writing, I was just writing in my own room. That is where it started. It didn´t start from being like “Ah, I´m trying to be a performer”. It started from trying to write and create and explain and describe. And so when it comes in that place, I think you are more comfortable beginning with recording and writing. I do love playing live, but it comes with so many other things. It comes with the logistics. People come to gigs and they think you magically teleported there. (laughs) What I love about recording is that there´s a purity in the whole thing. You are there, you can just soak into your creative world. For me, my favorite thing is writing and so with recording I can kind of really capture all the stuff that I wanted to capture. So I really love recording, but I do like playing live as well. minutenmusik: For those people who do not know you yet, how would you describe your music? Roo Panes: I would say it´s quite peaceful. It´s just natural. When I started I´ve always loved music that could take me to a different place. I guess it´s quite nice when life is very busy and getting on top of you, you just put something on and it takes you to a different place. I´ve always loved that. I´m not a kind of person who necessarily wants something to just be a soundtrack to my moment. I love stuff that transports you somewhere else. I like writing that kind of thing. Yes, it´s peaceful, to start with. And kind of classical. On records, there´s a lot of strings, a lot of classical arrangements, because this is kind of involved with my writings, how I think when I´m writing it. And so I tried really hard to make sure that I would be able to get all that stuff as well. I love that kind of help to create journeys. And it´s very lyrical. The most foundational thing for me is the lyrics, because I´ve always thought that you´ve got to have a purpose to be doing what you do. I don´t do what I do to sell records. I don´t do what I do to be well known. I do what I do because it´s amazing to write music about things I feel and I want to share with people. Lyrics are really a massive part of it. I purpose on poetry quite a lot. So, it is peaceful, poetry and classical. minutenmusik: Are the lyrics about your own life and experiences? Roo Panes: Yeah. I think it´s a bit like Instagram. You see something you love and you want to share. I see corners of life in my life or lessons I´ve learnt, like things that have been really profound to me. And I put them into music, because I think that in a way it is worth sharing, because there are a lot of things a lot of people go through that are similar. And I think sharing it does have value, because people see like “Oh, there is someone out there.” I think that’s a big thing. I also just love words. I love how they can say more. I can´t explain myself very well, but I can write really good poetry. And that has always just been something about me. I had to pay attention to that, like writing lyrics and writing poetry. I´m not very like that in conversation. It´s just something that happens in my mind when I write. That’s one of the things which I guess mean that I´m more of a writer. So, yeah, the lyrics are all personal things. minutenmusik: What are your plans for the future and the next steps in your career? Roo Panes: I don´t really know, to be honest. I´m really step by step. I love doing what I do, but the music industry is an interesting industry. I feel like you can´t really have done it. You can have done it, but I don’t really want to have done it. I want to just go song by song, album by album. As long as there are people that want to hear what I make, then I´ll make it. I´ll probably make it even if they didn´t. I hope there will be people who appreciate it, but I don´t know how long to go about it. I´m just happy writing and creating and as long as I´m releasing music, I´m pretty happy. So I don’t have a big grand plan. There´s always like day-to-day plans in life. I´ve got some exciting things to come up. Perhaps I´ll go abroad more and tour more, because I have the opportunity to do that more. There are great things happening. But in answer to that question, I always say it is just step by step. minutenmusik: How would your life look like if you were not a musician? Roo Panes: Oh, I don’t know. Probably quite similar, but doing something different. I like my lifestyle. I really like to be in the countryside. There are some things that wouldn´t change. It´s just that music really fits it. But there are so many other things I want to do. I really want to write a book one day. Roo Panes: I´ve got a couple of stories, but I shouldn´t tell you. (laughs) I just started a couple of that, but it´s a very long thing and also another very complicated world to get into, so at the moment I´m just enjoying writing. But I´d love to do that one day. When I was a child, I wanted to do writing. There´s a number of things I hope I will still do outside music, but one by one, step by step. minutenmusik: But always creative things? Roo Panes: Well, actually I was going to be a lawyer. And actually, I think I would quite like it, because in a certain way it is kind of creative. You have to think around situations and it has got lots of words. I love words. So I was thinking of doing that. Actually, it is interesting because with music and creative stuff, although I have seen a lot of that stuff, one thing that lacks is structure. There´s a part of me that loves structure and quite likes doing lawyer or something like that. So, yeah, who knows. minutenmusik: Whatever it will be, I wish you a lot of success. Thank you for the interview and enjoy the gig. Nächster Beitrag Interview mit Black Peaks über “Statues”! Interview mit Leony über ihre Solokarriere & ihre Pläne!